This a recipe from The Pioneer Woman's cookbook. They were delicious and different. I just wished I had doubled the recipe so we had more left to freeze for later. She pictured them served with mashed potatoes, which seemed a little strange to me, but we went for it anyway and loved the combo. Combine all sauce ingredients. 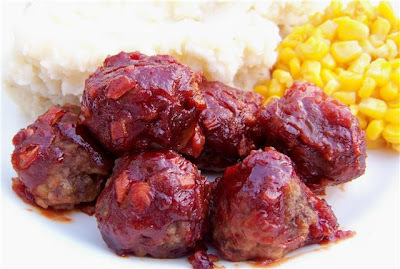 Pour over meatballs and bake at 350 degrees for 45 minutes. So, So good! Big hit at home and we had lots leftover so we took some to work to share and everyone loved them, all of the remainder meatballs were finished off by the 21 year old! This recipe I'll keep around for a while.